The destruction and replacement logic of urban planning that is obvious at Alexanderplatz and elsewhere is not unusual in urban planning. It is the result of different and deeply entangled historical developments; very often these developments are approached via a criticism of capitalistic positivism which subordinates ever more aspects of life under economically quantifiable patterns. With Buckminster Fuller’s phantastic exploration of geodesic domes and their material manifestations in mind, the sphere of Berlin’s TV tower served as a starting point to develop a collective contribution for the exhibition The Anxious Prop: Case 2 [Eccentric] , held in the pavilion at the base of the TV tower on Alexanderplatz at the 29th of July 2010. 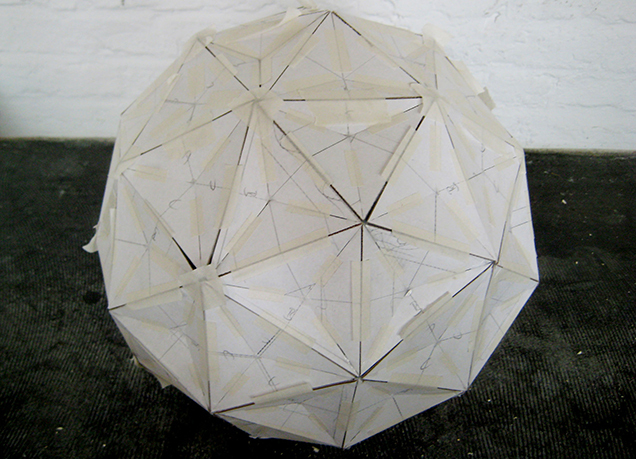 The Anxious Prop is a loose collective of architects, artists, designers, scientists, and philosophers which was established by Luis Berríos-Negrón in late 2009. The Wrecking Pendulum is a 1,5m diameter sphere composed out of 286 triangles after Archimedes’ geometric figure of the blunted icosahedron. 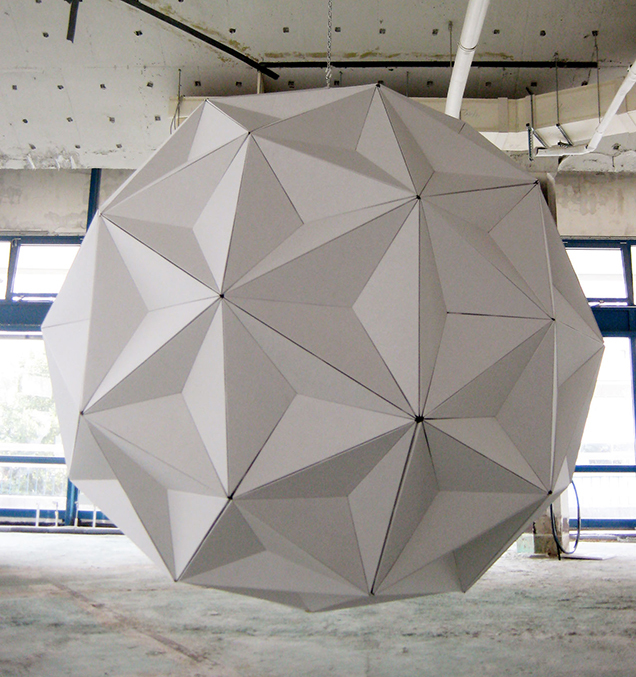 It was produced on-site, installed at the ceiling in alignment with the mechanics of the wrecking ball, and crashed against a wall of the pavilion during the exhibition. 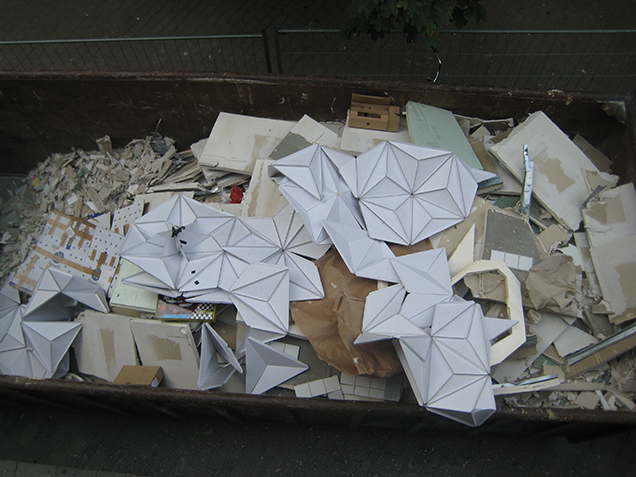 The resulting pile of decomposed triangles was thrashed after the event. Out of the pictorial documentation material taken on behalf of the exhibition, another project emerged. Following the principles of open source, the project was taken to a new collaboration with other professions. In an attempt to catch the micro historical development of the project, the videos and images were remixed into a video clip. Aiming at the economy of the internet audience, the visual logic of the clip was developed in accordance with a music track which was produced in parallel with a composition of selected audio samples. Even though Henri Lefebvre’s justfully expressed suspicions about the possibility and necessity of an epistemology of the urban,1 an epistemological point of view is indispensible in order to critically review the destruction and replacement mechanics of urban planning and to understand its modus operandi. The leading questions are: what are the ‘objects’ of urban design are and how are they designed? Instead of disguising the fuzziness of the city through a naïve positivistic attitude, urban design needs to embrace the “epistemic uncertainty principle” (Hans-Jörg Rheinberger) that every design process inevitably faces due to its creative component. Destruction has been one of the constituting generators of the multifaceted urban history of Berlin—a phaenomenon clearly visible in the progression of figure-ground-plans. Demolitions appear not only as a result of war but also as a mean of planning during the city’s division and the successive replacement of nodes in the urban fabric in the name of eastern and western modernization and German reunification. One of the places that passed through drastic spatial transformation is without a doubt the Alexanderplatz. Its turbulent history and myths deeply coded a cultural memory of the urban fabric, becoming one of the principal crossing points of large-scale urban—if not international—planning patterns.